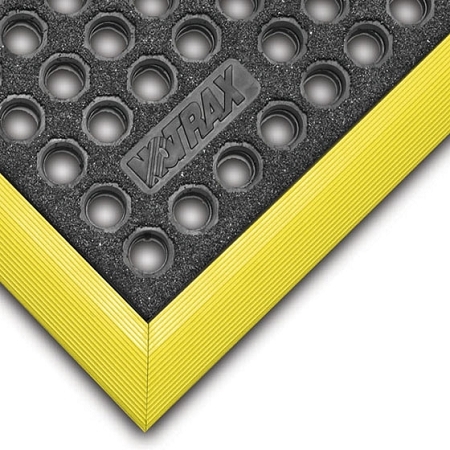 The 850 Niru® Cushion-Ease® GSII™ Floor Mat is made of 100% Nitrile rubber compound combined with a silicon carbide grit surface to assure high resistance to industrial chemicals, oils, greases, and everlasting traction to prevent slip accidents. 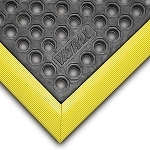 The large holes on this safety mat make up a drainage system to for easy removal of liquids and debris keeping work environments free from accidents. 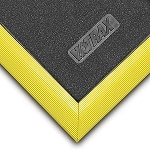 The thickness of this floor covering is excellent for proper blood circulation which reduces muscle fatigue and lower back pain keeping workers on their feet for longer periods of time increasing their productivity. 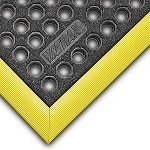 This floor padding is available in different sizes and easily snap together for custom configurations.